Large Enough to Handle Any Job! If you have a fleet truck or an RV, you know how challenging it can be. Most auto body shops in Massachusetts don’t have the extended ceilings in their shop. This can reduce the number of places where you can get the work taken care of. At Cloot’s Auto Body we designed our shop for everyone. Small cars? No Problem! Large RV? No Problem! 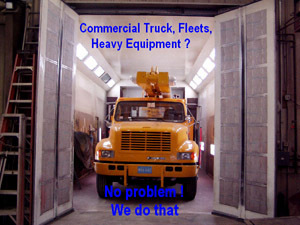 We have the size that can handle any size vehicle. The more room there is to work the better the repair will come out!